When you are launching a new business (or even if you are a fairly established business) you experience peaks and troughs when it comes to monthly or quarterly revenue. When things are flowing, you think they are going to flow forever. And when things dry up you feel like you might have to close shop in a few weeks. Of course, when things dry up, you begin to feverishly work to drum up new sales. You have nothing in your pipeline, but you hope that by sending out emails, setting up new appointments and following up with old contacts, that maybe, just maybe you will land a “bluebird” that will help get you to the next month. Early on in this entrepreneurial journey I discovered a somewhat unspoken truth about revenue growth: get busy and business comes – albeit from places you would least expect or predict. I think this is something many other entrepreneurs experience and when I heard someone say it out loud, I was like – OMG – that has been my experience too! 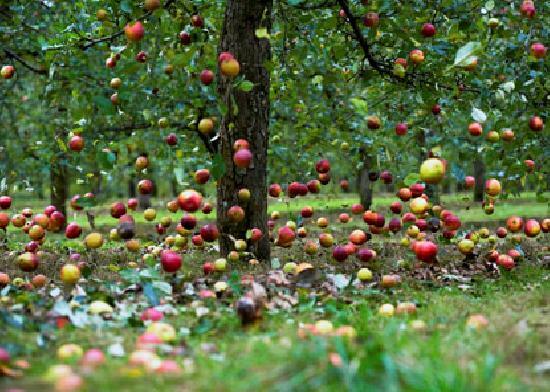 A while back I wrote a post about how trees serve as a great metaphor for entrepreneurship – now there is an extension to the analogy: when you shake the tree, fruit falls. As many of you know, networking has become a big part of Keyhubs’ business development strategy. We started out networking for selfish reasons, but have learned that it is actually a fine art – a perfect opportunity to pay-it-forward. Done correctly, we believe it can take individuals and businesses on magical and mysterious journeys of untold personal and professional growth. That’s all fine and good, but it was not until we took a closer look at our expenses for 2011 (in preparation for tax filings) that we realized how inexplicably linked networking was to revenue growth. Can we quantify this tree-shaking phenomenon? 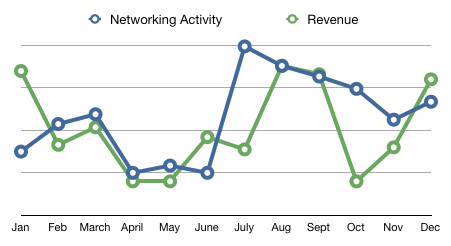 Below is a graph – the green line represents our monthly revenue in 2011. The blue line is how much we spent on face-to-face networking (business lunches, coffee chats, etc.) over the same period. Revenue is significantly larger than networking investment; however, the graph axes have been normalized for better visualization. At first glance, one would say sure – you spend time and money on meeting people and that will lead to business. Make business calls and you will land new deals. Yet, less than 25% of our revenue in 2011 can be traced directly to our 2011 investment in networking. Yes, the more active we were, the more business we received; however, the two were not neatly tied together in cause and effect. The simple act of networking seemed to generate business, but from unexpected and unrelated channels. Busy-ness led to business, but not in a way that was predictable. What are the chances the two measurements would line up so nicely? While we need more data points to draw strong statistical conclusions, the exercise has reinforced our belief that when you connect with people unselfishly, business has a way of boomeranging back. We love to network for networking sake – we do it because we want to get to know and help people. We find that when we approach networking from that perspective, the Network rewards us with new leads, opportunities and business in ways that are both miraculous and unfathomable. Great post, Vikas! I especially like seeing the graph. It affirms my inclinations. I’m glad to be one of the many beneficiaries of your generous networking. Thank you Michael! I appreciate the feedback. I am looking forward to our collaboration and finding ways to connect you with people who can help in your efforts. you are correct, there is a link between networking and building your business, both in terms of revenue and in terms of understanding. When you network, you exchange ideas, insights and find opportunities. Especially for small businesses. Thanks for the feedback! I appreciate your insights. I too feel grateful for the effort you put into exploring connections and relationships even when you aren’t sure it will lead to business. After our conversation, I explored one of your suggestions and got in touch with Jeff Mohr at kumupowered.com and we are exploring ways to map the networking that takes place at our conferences and convenings. It has been a really enriching experience! So thank you! I love the graph and wonder… how do you track your networking activity at KeyHubs? Networking and knowledge-sharing are definitely drivers of our business but we struggle to track these activities across the organization. I’d love to know more about your approach. Also, would you be interested in repurposing this post for our new blog? Let me know if you’d like to know more. Great to hear from you! Thanks for the feedback. Glad to hear the connection with Jeff Mohr has been enriching and helpful. Given our size, it probably a bit easier for us to track “networking activity”. I can imagine it would be trickier the larger you get. That said, we simply keep track of costs associated with networking, which usually happen over lunch, dinner or coffee chats. In this way, we can get a sense of how busy we are from a networking perspective. I would love to repurpose this post for your blog – I will send you an email and we can discuss further. Again, great to hear from you Justine – looking forward to connecting soon.